Navigate to Studio One/Options/Audio Setup/Audio Device (Mac OS X: Preferences/Audio Setup/Audio Device) to open the Audio Device settings window. Mac OS X: Select your chosen playback (output) device from the Playback Device menu. Select your chosen record (input) device from the Record Device menu. Windows: Select your device for audio input and output from the Audio Device menu. Some devices offer a selection of configuration options. If your connected device has those controls, you can click on the [Control Panel] button next to the device selection drop-down menu and make your changes within the device’s control panel. If your device does not offer these options, the Control Panel button is grayed out. Set Device Block Size to fit your needs. Lower settings minimize latency, which is useful when tracking. Higher settings bring more latency, but give you additional processing power for effects and instrument plug-ins. Generally, you want to pick the lowest block size that still lets your system perform correctly. If you require higher performance but want to keep latency low, you can increase the level of Dropout Protection and employ Low-Latency Monitoring, as described here. When you are working with a large amount of audio tracks and virtual instruments, computer performance can limit your capabilities. You can increase the amount of buffer to help free up computer resources, but this traditionally comes at the cost of greater latency (or delay) when monitoring audio inputs or playing virtual instruments. Set the buffer too low, and audio dropouts and glitches can occur. To remedy this, Studio One features Audio Dropout Protection and an advanced Native Low-Latency Monitoring system. Under this system, the tasks of audio playback and monitoring of audio inputs and virtual instruments are handled as separate processes. This, in effect, lets you use a large processing buffer to handle heavy audio playback and effects processing tasks, while keeping latency low for audio input and virtual instrument monitoring. The latency that you hear when monitoring audio inputs or playing virtual instruments is based primarily on the Device Block Size that you specify in the Studio One/Options/Audio Setup/Audio Device (Mac OS X: Preferences/Audio Setup/Audio Device) window. For the lowest latency, Device Block Size should be set to the lowest setting that provides the performance you need. The Audio Dropout Protection system uses its own buffer for playback and processing of audio tracks, distinct from the Device Block Size setting. The size of this buffer (also known as the Process Block Size) depends on the Dropout Protection level that you specify in the Studio One/Options/Audio Setup/Processing (Mac OS X: Preferences/Audio Setup/Processing) window. If you use Native or Hardware Low-Latency Monitoring, the Dropout Protection level has no effect on audible latency, though higher levels can affect the responsiveness of onscreen meters and displays. As long as the Process Block Size is larger than the Device Block Size you've specified, you have the option to use Native Low-Latency Monitoring. The Monitoring Latencies display shows you the latency values for audio inputs (round-trip, from input to output) and virtual instruments, based on the current Device Block Size and Dropout Protection settings. The "Standard" column shows the latency for the current settings if you choose not to use Low-Latency Monitoring, while the "Low Latency" column shows values for the Native Low-Latency Monitoring system. When monitoring an audio input or virtual instrument through the Native Low-Latency Monitoring system, any inserted FX on the corresponding Channel continue to function and can be heard in real time, provided that they add 3 ms or less of latency. Plug-ins that meet this latency requirement show a green power button in the Console (rather than blue or gray). Any inserted plug-ins that introduce more than 3 ms of latency are not audible in the monitoring path while a Channel is armed for monitoring or recording under Native Low-Latency Monitoring. They begin functioning again when recording/monitoring mode is disengaged. Navigate to the Studio One/Options/Audio Setup/Processing (Mac OS X: Preferences/Audio Setup/Processing) settings window. Choose your desired level of protection from the Dropout Protection drop-down menu. The Process Block Size display shows you the corresponding processing buffer size. If you want to use Native Low-Latency Monitoring, choose a Dropout Protection level that sets the Process Block Size to a value that is higher than the Device Block Size you have selected. For low-latency performance when playing virtual instruments, enable the "Enable low latency monitoring for instruments" option. If you run into performance issues when using a virtual instrument with particularly high CPU usage, you may want to disable this option. If using a supported DSP-enabled audio interface, you have the choice to use its onboard Hardware Low Latency Monitoring (and hardware DSP-based effects when available, as with the PreSonus Studio 192) for incoming audio inputs, or to use the Native Low Latency Monitoring that Studio One provides. Enable "Use native low latency monitoring instead of onboard DSP" to use Native Low-Latency Monitoring, or disable it to use Hardware Low-Latency Monitoring. Note that when using Hardware Low-Latency Monitoring to monitor an audio input, Insert FX do not function on the related Channel, since the audio input is being monitored before it reaches Studio One. If Insert FX are needed while tracking, use Native Low-Latency Monitoring instead. To do this, navigate to Studio One/Options/Audio Setup/Processing (Mac OS X: Preferences/Audio Setup/Processing) and enable the "Use native low-latency monitoring instead of hardware monitoring" option. 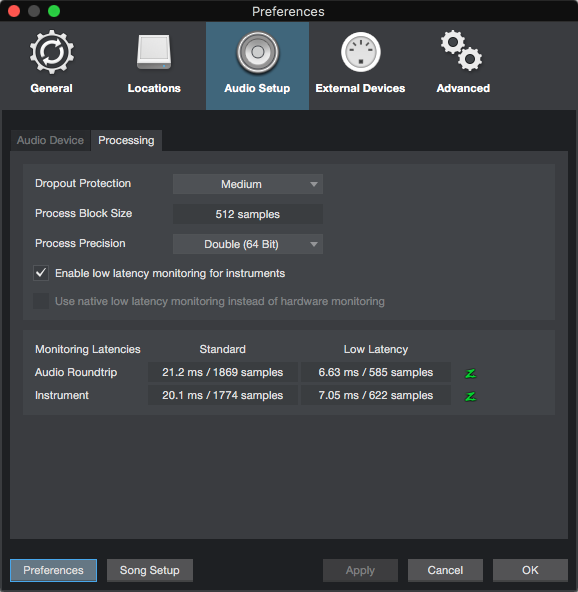 Once you've configured your system to use Native or Hardware Low-Latency Monitoring, you can toggle low-latency monitoring on and off for the Main output as well as any Cue Mix outputs you've specified, by clicking the Enable Low-Latency Monitoring button ("Z", short for Z-Mix) below the volume fader for the related output. When low-latency monitoring is disabled, the "Z" button goes dark. When Native Low-Latency Monitoring is enabled, the "Z" button turns green. When Hardware Low-Latency Monitoring is enabled, the "Z" button turns blue. This table describes the primary monitoring methods available in Studio One, and the conditions that must be met to use them. Studio One supports most audio devices, including those that run on ASIO or WASAPI (Windows) or Core Audio (Mac OS X) drivers. When using a WASAPI audio device in Windows, note that WASAPI offers Exclusive and Shared modes of operation. In Exclusive mode, lower latency can be achieved, but other applications (such as Windows Media Player) cannot use the audio device at the same time. Refer to the Windows Control Panel/Hardware and Sound/Sound to configure the options for your WASAPI device.